People are surprised when I mention that until recently I have never made an apple pie. Though I come from a family of bakers, pie was not something we routinely had at our house. It was reserved for holidays and then it was primarily pumpkin pie. So when I saw a basket of beautiful apples at the farmer's market I decided it was time to rectify this. 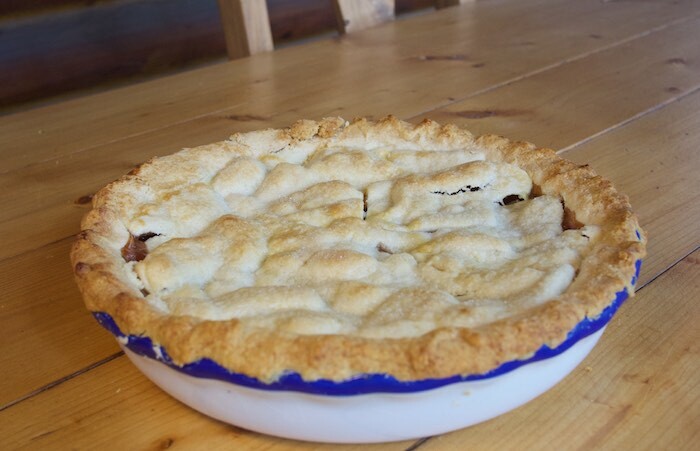 Like most pies, apple pie is a fairly simple mix of sliced apples and a few spices. Achieving a perfect crust is the difficult part. Although, I liked this crust a lot, next time I may try it with 1/2 Crisco & 1/2 butter...just to see the difference in taste and texture. Position rack in bottom third of oven and preheat the oven to 425° F.
Prepare the pie dough. On a lightly floured surface, use a rolling pin to roll out half of the pie dough into a circle. Place the circle of dough inside a 9-inch pie pan so that it hangs over the edges of the pie pan. Cover loosely with plastic wrap and refrigerate at least 20 minutes. Roll out the remaining pie dough on a lightly floured surface to about 14 inches in diameter. Gently place the dough circle on a parchment paper lined sheet pan, cover loosely with plastic wrap, and refrigerate for 20 minutes. Place the sliced apples, lemon juice, and sugar in a large mixing bowl and toss to combine. In another bowl, stir together the flour, cinnamon, nutmeg, and salt. Toss the flour mixture with the apples and allow the mixture to sit for 10 minutes. Remove the piecrusts from the refrigerator. Fill the bottom crust with the apple mixture, mounding the apples into the pie plate. Top the pie with the remaining dough circle, allowing the edges to hang over the sides of the dish. Using kitchen scissors, trim the dough so that only an inch hangs over the edges, pinching the top and bottom crusts together as you trim. Using your index fingers and thumbs, go around the edges of the pie crimping the dough in a wavy pattern. Using a paring knife, cut several small slits in the top of the pie to allow steam to escape while baking. Whisk together the egg and water. Lightly brush the mixture onto the top of the pie and sprinkle with sugar. Place the pie on a baking sheet and bake for 20 minutes. After 20 minutes, reduce the oven temperature to 350º F and bake for an additional 25 minutes. At this point you should check pie and cover lightly with aluminum foil to make sure it doesn't get too brown. Bake covered an additional 20 to 25 minutes. Remove the pie from the oven and allow to rest until cooled, about 1 hour. Place flour, salt, and sugar in a food processor and combine. Add butter to the flour mixture and process until it resembles coarse meal. Gradually add ice water, using just enough so the dough holds together. Turn the dough out onto a lightly floured work surface. Divide dough in two. Place each piece on a sheet of plastic wrap. Grasping the ends of the plastic wrap with your hands, press the dough into a flat disc with your fists. Wrap in the plastic, and chill for at least one hour. Yeah, crust is my nemesis! Your pie looks wonderful and I bet it tasted fabulous, too!! Ah, homemade apple pie, one of life's most satisfying comforts!